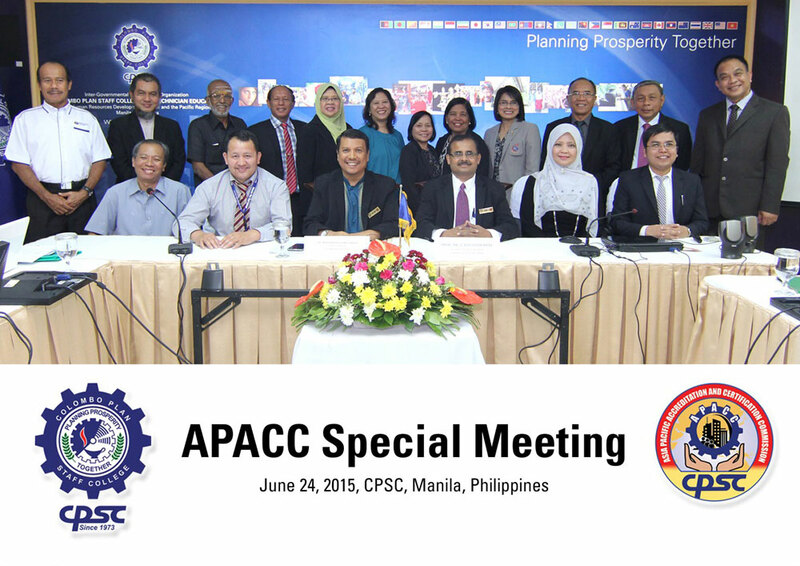 A first for CPSC's Asia-Pacific Accreditation and Certification Commission (APACC), an APACC Special Meeting kicked off in Manila, Philippines at CPSC on June 24, 2015 in view of establishing the Association of APACC Accreditees (AAA) and to exchange relevant information and updates about their respective TVET systems. With the hope of sparking a substantial exchange of ideas, methods and best practices to further reinforce institutional quality advocacy not only in a specific country but in the whole region as well, the APACC President and CPSC Director General Dr. Mohammad Naim bin Yaakub welcomed the seventeen (17) APACC NCAs (National Coordinator for Accreditation) and representatives from different TVET institutions in India, Malaysia, Mongolia, Thailand and the Philippines for the Special Meeting. Among the meeting attendees were vocational school administrators, directors and heads of Gold and Silver-level APACC accredited institutions. Dr. Naim initiated the discussions by sharing his thoughts about benchmarking on student's international mobility and imparted about the Asian University Network (AUN) Regional Qualifications Framework. His talk was intended to add to the existing knowledge of institutional cooperation and adoption of standards necessary to assess the quality of the school's programs, administrative operations and other relevant matters. The NCAs composed of Mr. Elpidio Mamaril Jr., Director, Certification Office, Technical Education for Skills Development Authority (TESDA), Philippines; Pn. Noor Aidi Binti Nadzri, Director, Instructional and Digital Learning Division, Department of Polytechnic Education, Malaysia; Mr. Rangsan Thepmondhri, Chief, International Strategy for Vocational Education and External Relations Section, Liaison Officer, Office of the Vocational Education Commission (OVEC), Thailand; and Mr. Tsagaach Batbayar, Officer for International Accreditation, Mongolian National Council for Education Accreditation, Mongolia provided overview of and updates on their educational systems through country presentations. Dr. Dhinamani Brahadeeswaran, Adviser, Nachimuthu Polytechnic College, India, also shared about their country's educational systems and current status of its TVET systems. The special meeting also provided a platform for consultations and considerations on establishing the Association for APACC Accreditees and other APACC promotions such as: the need to have a Secretariat to facilitate communications, programs, meetings and other activities of the group or organization; drafting of concrete set of goals, policies, objectives and purpose of the organization; dissemination of information in different countries to promote AAA; financial considerations and implications; AAA's organizational structure; staff exchange and benchmarking activities; and other common goals to be established in the promotion of cooperation among institutions in the CPSC member countries through the AAA. Meanwhile, all the attendees strongly agreed that a network among the accredited institutions is indeed timely and relevant to make TVET systems in the Asia Pacific region a potent force for progress of participating CPSC countries. The meeting also concurred that AAA's Secretariat host will be APACC at CPSC. India, Thailand and Malaysia volunteered to conduct the next meeting for the association, then concluded that the next meeting will be held in Malaysia due to the fact that their institutions have already been accredited, which makes a visit to the institutions possible. 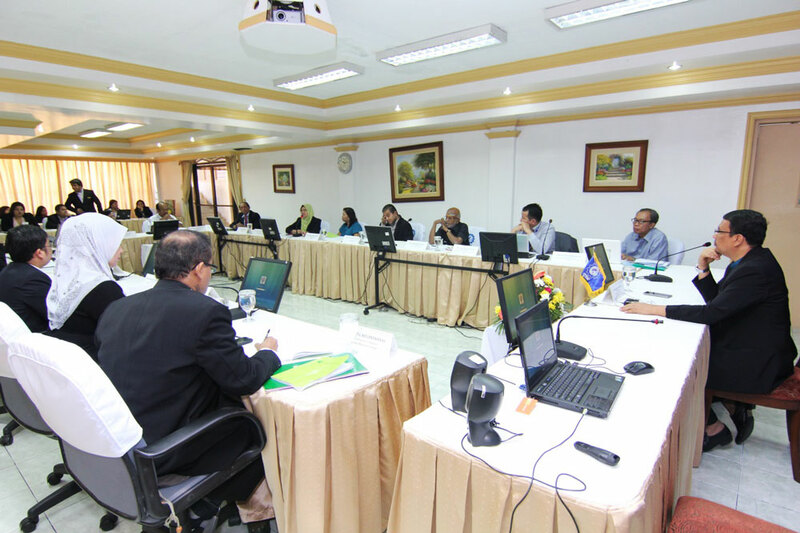 CPSC and APACC were also invited to be a part of the jury for the upcoming TVET 2015 e-convergence organized by the Department of Polytechnic Education (DPE), Malaysia from August 1-30, 2015. The event brings together all polytechnics in Malaysia to present short videos that will best capture the sharing of perspectives, ideas and practices via the online video sharing website. The "Jury Marking Scheme", which is a part of the jury documents for the upcoming event, was presented to Dr. Naim by Pn. Noor Aidi binti Nazri, the National Coordinator for Accreditation in Malaysia. Other attendees include Dr. Govindarajan Kulanthaivel, Seconded Faculty Consultant, CPSC; Dr. Paiboon Saiyawongs, APACC Special Officer, Rajamangala University of Technology Thanyaburi, Thailand; Pn. Norlida Bt. Abd Razak, Director, Politeknik Sultan Haji Ahmad Shah; Tn. Hj. Noor Azahan Bin Othman, Director, Politeknik Kota Bharu; En. Abdul Karim Bin Jaafar, Director, Politeknik Sultan Azlan Shah; Tn. Hj. Zulkifli Bin Arrifin, Director, Politeknik Seberang Perai, all from Malaysia; Ms. Ruth Pundang, Vocational School Administrator III, Lupon School of Fisheries; Mr. Egmedio O. Valdez Jr., Center Administrator, Regional Training Center, Korea Philippines Vocational Davao; Ms. Maria Clara B. Ignacio, Center Chief, TESDA Women's Center; Dr. Clarissa C. Posadas, Vocational School Administrator III, Puerto Princesa School of Arts and Trades, all from the Philippines; Dr. Kamolwan Chaochanglek, Director, Phetchaburi Polytechnic College; and Dr. Pongsatorn Pimpanit, Chief of Vocational Education Standard and Qualification, OVEC, both from Thailand. CPSC through APACC is optimistic that the special meeting will be instrumental in its goal of linking institutions through a common aspiration to further improve the offering of TVET programs and promote a highly skilled, highly mobile workforce that is adaptable to the different challenges in the world of work.